I have been looking at the revenue figures posted for a variety of diversified manufacturers and distributors. These are well-respected, S&P500 firms. One would expect these firms to be posting decent revenue gains, especially as compared to the very weak year-ago period (4Q2008). Additionally, these firms stand to benefit from the prevailing economic climate due to their size, global sales, high accessibility to credit at favorable terms, access to stimulus business, etc. In essence, whatever general economic strength is existent, and then some, should certainly be reflected in their revenues. Instead of strong or at least a decent 4Q 2009 revenue results, most of these companies are reporting continued percentage sales declines when compared to year-ago results. These declines have ranged in value but are significantly negative, with some being double-digit declines. This result is not significantly better than the similar comparisons that I have previously commented upon for 3Q2009 results. This lack of revenue growth is very notable and has many implications. 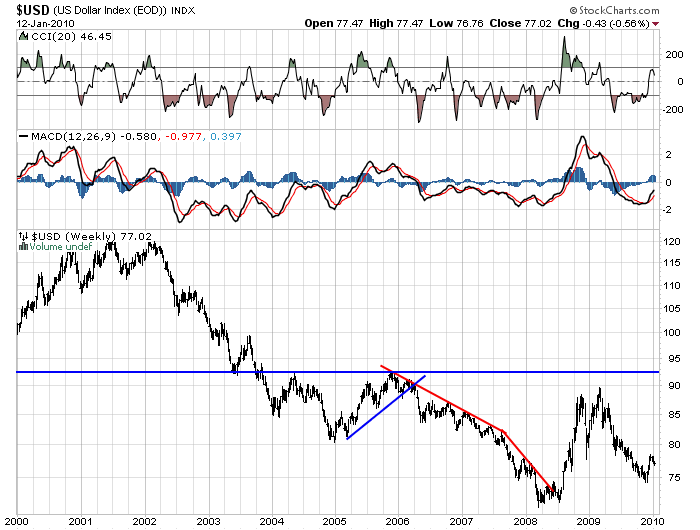 It seems to at least partially belie claims of economic recovery. As well, it would explain why (net) hiring is rather nonexistent. Of course, there are other implications as well. Among these implications is that the lack of revenue growth weakens any fundamental valuation one may choose to assign to the stocks of these companies. This entry was posted in Business, Investor and tagged double-digit revenue declines on January 29, 2010 by Ted Kavadas. First, many stimulus initiatives were mentioned. Some of these were new ideas. That stimulus ideas are proliferating should not be a surprise, as many in our country believe they represent a sensible solution to our many economic difficulties. I will comment on many of these initiatives when more details are available and/or they are enacted. For now, I will say that before we, as a nation, enact more stimulus bills, we need to analyze the results of the many stimulus efforts previously and currently enacted. Then, we need to assess the unintended consequences and risks these stimulus efforts hold, of which I have previously mentioned on this blog. Second, the employment situation was mentioned. This, of course, is not a surprise and is a very popular topic among all politicians – and for very good reason. I believe that our unemployment problems, both current and ongoing, encompass a population many multiples of seven million. Our unemployment problems will most likely not be solved by any easily enacted solution, unfortunately. This entry was posted in Intervention, Unemployment and tagged additional stimulus, President Obama, Unemployment on January 28, 2010 by Ted Kavadas. I would argue against those who believe that bubbles could start to form or that they are just beginning to form. I strongly believe that there are many bubbles in existence right now, and the implications of such are massive. Over the last few months I have written quite a few posts on bubbles, and those posts can be found on in the “Bubbles” category listed on the right-hand side of the home page. This entry was posted in Bubbles (Asset) and tagged asset bubbles, bubbles on January 27, 2010 by Ted Kavadas. The article is interesting in that it summarizes various facets of the “strategic default” situation and presents an interesting example of the dynamics that one “underwater” homeowner faces. I have mentioned “strategic defaults” on numerous occasions. It is a very important “wildcard” in the residential real estate equation. This entry was posted in Real Estate and tagged strategic defaults on January 26, 2010 by Ted Kavadas. Over the last few years the political scene has become more volatile, swinging from heavily Republican to heavily Democratic. Now, it appears as if the political volatility is increasing yet again, with the recent election of Scott Brown and the unexpected hurdles Ben Bernanke is facing during his reconfirmation. Many incumbents (and political appointees) who until recently seemed to hold “safe” positions may well find themselves open to losing elections. Many would view this increased volatility as a positive sign the political system is “working.” Of course there is credence to this view. However, from an economics perspective, there are other consequences as well. The implications are potentially vast. I have written extensively about interventions, and will continue to do so. They are very much misunderstood. Of particular concern is that as time goes on and our financial problems grow in size, there has been a growing insensitivity to the ever-increasing size of the interventions. Whereas just a couple of years ago a $150 Billion intervention would seem large, now that same size of intervention would be considered small. While I have previously written that interventions would continue, it is important to understand what factors are driving the trend. This entry was posted in Intervention, Uncategorized and tagged interventions on January 25, 2010 by Ted Kavadas. I would like to provide an overall update as to my thoughts on our current economic situation. Many of my concerns and reasons for such an outlook have been expressed in this blog. Of course, over the last few months there have been signs of economic recovery – or at least a lessening of economic weakness. However, I believe that these signs represent the type of intermittent economic strength that is often seen during periods of prolonged economic weakness. This entry was posted in Depression and tagged current economic situation, Depression on January 19, 2010 by Ted Kavadas. As seen in the survey details, there hasn’t been much change in expectations concerning full-year 2010 GDP or the Unemployment Rate for many months. The average expectation is for a full-year GDP of 3.0% and Unemployment Rate for December 2010 of 9.5%. 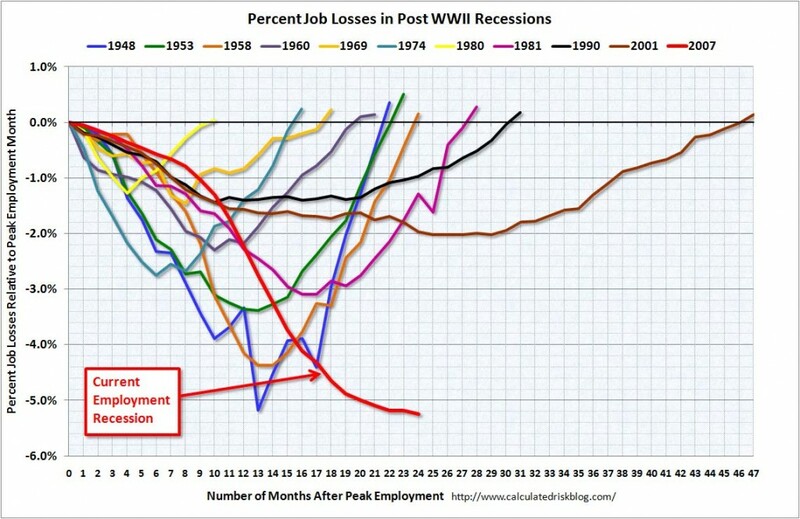 This entry was posted in Economic Forecasts and tagged Economic Forecasts on January 15, 2010 by Ted Kavadas. 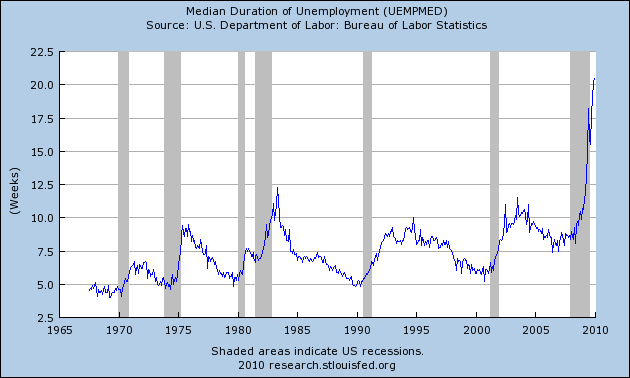 First, from the St. Louis Fed site, the Median Duration of Unemployment. As depicted by these charts, our unemployment problem is severe. Unfortunately, there does not appear to be any “easy” solutions. 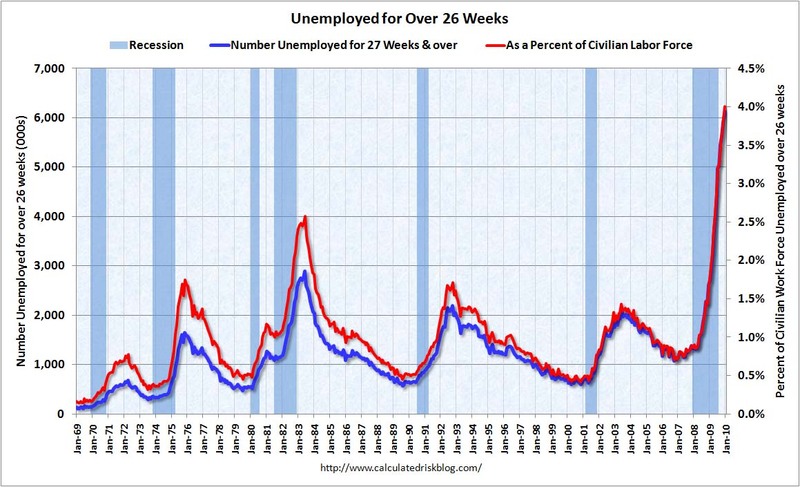 This entry was posted in Unemployment and tagged median duration of unemployment, Unemployment on January 12, 2010 by Ted Kavadas.